It’s easy to comply with GHS label rules. Find premade GHS labels for over 20 common chemicals. Or, choose a custom template and easily create your own GHS label designs. • Custom and premade templates come in several handy sizes, from 2” to 10” tall. • Once you’ve made your selection, you can then download a PDF. 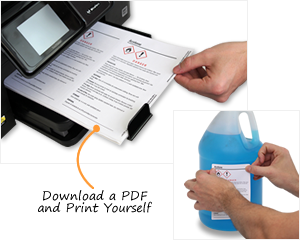 Print the labels on your own printer using standard Avery 6876, 5168 or 5163 templates. Buy stationery from most office supply stores. For extra durability, ask for our vinyl blank labels that are designed specifically for harsh chemical and lab environments. Label stationery matches our GHS chemical label templates. These blank laser label sheets use a durable vinyl with a qualified “drum” adhesive that is superior to standard Avery materials. We offer more GHS templates, including those that highlight the PPE to use and the potential Target Organ effects. Click here to see more GHS labels templates with downloadable PDF’s. Some of our most common chemicals and their GHS labels are shown below. Each can be downloaded for free, as a PDF. Then print them yourself. 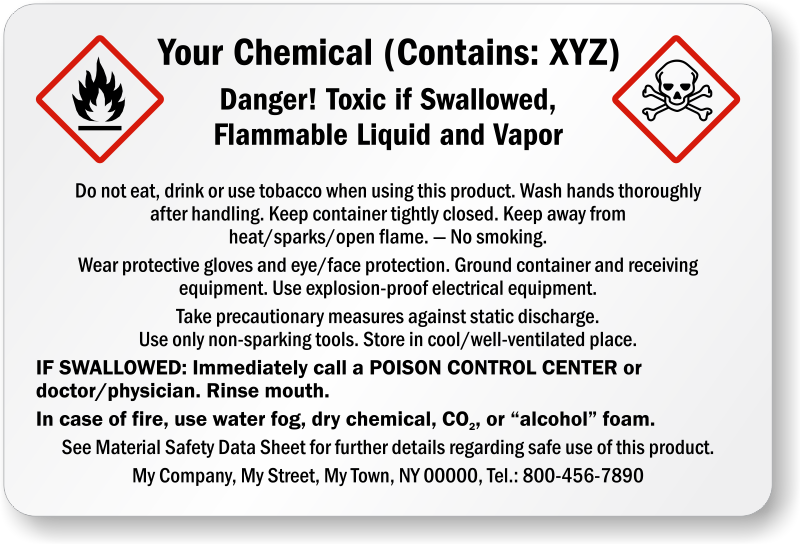 We offer free GHS labels for many other chemicals. Click here to find other chemicals. The labels were exactly like I needed them to be. Design help was awesome and completed quickly. The quality of product and fast lead time will keep us coming back! My choice from now on. Making a customized label was exceedingly simple. Now my staff does not have to try to squeeze all of the information on to a blank label. Beautiful finish, fair price.